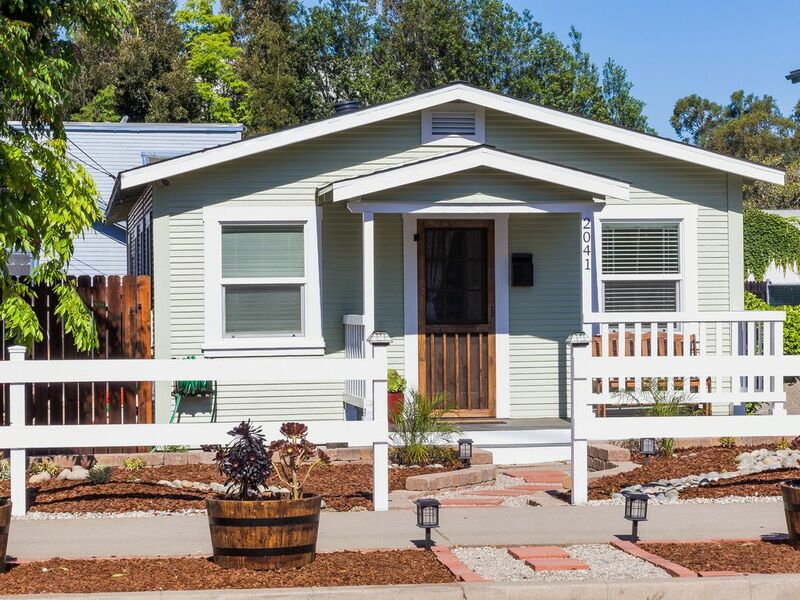 Located near SLO's Famous Downtown area, this newly renovated two bedroom cottage is a short walk to downtown shops/restaurants/nightlife. Everything is brand new, ready for you. The property includes a zen-like garden with a deck and a BBQ. For some ommm and some yummm. And make sure you sign a rock in our famous rock fountain. The living room features a flatscreen TV, HD Cable with HBO, a sofa which pulls out to sleep two, wifi, wireless printer and keyless entry. One bedroom has a very comfortable queen sized bed and the other room as an equally comfy full size bed. If you want cheaper prices, check out our property on AIRBNB. Beth and PJ are the owners. Beth was originally born and raised in SLO and wanted to return to her roots. Beth and PJ are both in the entertainment industry in LA and wanted to find a place where they could catch their breaths. And they found it. Here on Beebee St. Beth was a performer on Broadway in New York, performing in Legally Blonde, Good Vibrations and Young Frankenstein. She is in a band called Totsy now and acts and writes for TV, as well. PJ owns a successful production company called Gear 6 Productions, which has produced several IMAX educational films for the Discovery Science Center. He is also a commercial actor...with a Mercedes car commercial out this summer. Together, they have worked their booties off to bring this house from drab to chic. They are very excited to open their home up to you. May you enjoy it as much as they have. We wish you could see the transformation we did on this house. We took a house that needed a lot of love and gave it a big fat hug. This property is on a peaceful street, with a lovely breeze that gently rolls by. Close enough to downtown, but far enough away to hear the birds sing. The swing on the front porch, as you listen to the birds chirp. The fun old school phone hanging in the kitchen. The diner style table and chairs. The zen-like garden. The rock signing garden! And close to downtown. Lots of character and lots of heart. This is your home away from home. A hop and a skip away from Downtown San Luis Obispo, where you can indulge in the famous Farmer's Market on Thursday nights, check out Bubble Gum Alley, take in the beautiful Mission Church and more. We have a fun retro phone you have to see. We have a proper dining room table which seats four and we also have a fun dining area in the kitchen which sits two. Nice, relaxing deck next to our peaceful garden. We stayed here while visiting Cal Poly for our daughter. It was adorable, and conveniently located to all of SLO. It was super clean, had all the amenities one could ask for, and wonderful beds. There is a very cute sandwich shop just down the street. The cottage also has a delightful patio for sipping wine and having morning coffee & donuts. We will definitely be back. This is such a charming house with an excellent location. Everything was very clean and well stocked. The owners are responsive and accommodating. We will be back again! Nice house, close to downtown and all of SLO. Very clean and well maintained. Lovely home with the most comfortable master bed. Great backyard deck to just lounge around and chill. Within walking distance to SLO's best coffee house and deli. Would definitely stay here again. The best place to stay! We absolutely adore this cottage. Beth and Paul have it perfectly furnished, so we have everything we need for our stay. The bed is so comfortable, the couch and streaming video are perfect for relaxing after a day of hiking. The location can't be beat and the neighborhood is super quiet at night. We hiked, and dined, and had an amazing trip. This was our third stay and we hope to come back again soon! We were in SLO for a wedding. We loved being centrally located and within walking distance from a deli and a coffee shop. The cottage was cute and was the perfect home base for us and our toddler. They have thought of so many details and the home was very well stocked. The renovations kept the home clean and current while still maintaining it’s charm and character. The beds were exceptionally comfortable and we missed them when we got home. The neighborhood was very quiet, even on Friday and Saturday. We would happily return again. On the edge of downtown, we enjoy the peace and quiet but are just a few blocks away from all the action. Our local favorites are Thai-rrific, great Thai food, The Station, an adorable hip wine bar that used to be a filling station. If you are into staying fit, there is a spin joint called Cycletribe just a block away, along with a yoga place. You will get addicted to the delicious and fresh cinnamon rolls treats at House of Bread, just a few blocks away. And indulge in a sandwich from the local High Street Deli or Ben Franklin's. I'm sure you've heard about Farmer's Market on Thursday Nights where they block off traffic and replace it with BBQ, performances and farm fresh produce. Downtown, there is a lot to see, from the historic Mission Church to the fun germ infested walls of Bubble Gum Alley to the local restaurants and bars. A car ride away, we recommend soaking in the natural spring waters of Sycamore Hot Springs, taking a romantic walk down Avila Beach, shooting some breathtaking shots along Montana De Oro and hiking to the top of Bishop's Peak to name a few. And of course, don't forget about all the lush vineyards. The Central Coast is full of stunning sights and adventures to be explored and experienced.